I've recently become a Stirlander myself, having started warhammer again a couple weeks back, and got my first box of troops last week which i plan on making into spearmen. I'm planning on creating a large warband from Gablitz and it's surrounding areas, Was thinking of having my Captain/General as a noble from Gablitz for fluffy purposes. 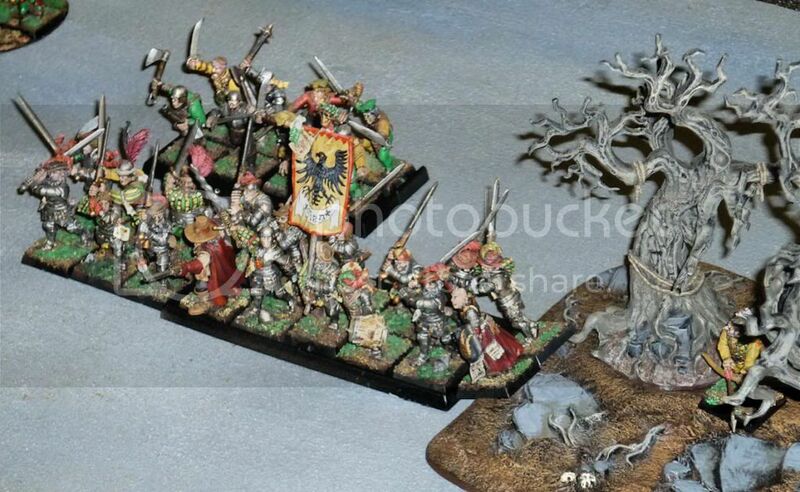 Anyway, I'm gonna post my Warband/army list and a couple pictures up. Comments appreciated. Pictures of the first spearman, I appologise for the quality. http://warhammer-empire.com/theforum/index.php?topic=39053.0 - My WIP Fluff. Allow me to introduce my Stirlandish army. General Roberto Vladermiester is of course the leader and final word in all things warfare. At a young age while out on a hunt with his ward, Roberto stumbled across an egg left alone in the nest of a mighty Griffon, fearing for the life of the creature and that it's mother had abandoned it he took the egg back to his home and told his father. Furious with his son, and fearing that the beast would cause problems for the family he had the ward removed from service and sent his son to be trained at the army barracks. His other son Daffyth, he had been horrified at the events and had demanded that his father explain why he had acted so extremely. For his efforts Daffyth was sent off to become a member of the cult of sigmar and was trained under the scrutiny of a warrior priest close to his family. To keep his name from further shame, Roberto's father sent the griffon egg off to a farm estate of the family's and swore that noone was to speak of it again. During his time in the military Roberto had excelled at strategic manouvers and quickly found himself promoted to the sergeant of his unit. After some time he made his way through the ranks to achieve the title of captain. It was however, his heroics at the battle of the hoe, where himself and one regiment of halberdiers single handedly held off attack of an undead force from assaulting a small farm until support arrived. Little did his father know that during this time Roberto had been sneaking back to the family estate to check on the well being of his rescued creature. The two had bonded closely and he would frequently be seen flying on the Fawn's (the name he had fondly given the beast) back, not that anyone would dare spread such rumours upon pain of death. In his 3rd year as general of the force dire news spread to Roberto. His father had fallen in the dead of night and he rushed to see him. On his death bed his father bid Roberto go find his brother amongst the ranks of the priesthood and soon after died. Roberto did exactly this, he took Fawn and flew to the headquarters to find him. His brother, Daffyth had established himself a competent warrior priest and bid permission to leave the order in search of sigmar's enemies under the command of General Roberto. Now he is rarely seen without Fawn and Daffyth at his side as he strides above the army, scouting the lay of the land many leagues ahead of his force. Roberto, armed with dragon bow, great weapon, dawnstone, full plate armour and silver horn. He sits atop Fawn his griffon. Daffyth, Warrior priest and brother to Roberto, skilled in all manner of spiritual guidance. He wields a great weapon and wears the armour of meteoric iron. Abbigale Oakwood, captain and bearer of the standard for the army. Shapeshifter and master of beast magic. Level 2 battle wizard of life or beasts with rod of power. Almarno Trise, expert engineer from Nuln, bearing his greatest invention to date, the hellblaster volley gun. He travels with the army due to a debt he will not speak of with anyone but Roberto. State Halberdier regiment, Roberto has personally trained these troops to dismember the heaviest armoured of foes. 30 halberdiers with armour piercing banner and command. Detatchment of archers deployed in loose formation. Detatchment of swordsmen, armed and trained by Roberto's own funds. 10 Huntsmen, Scouts for the force and skilled marksmen. 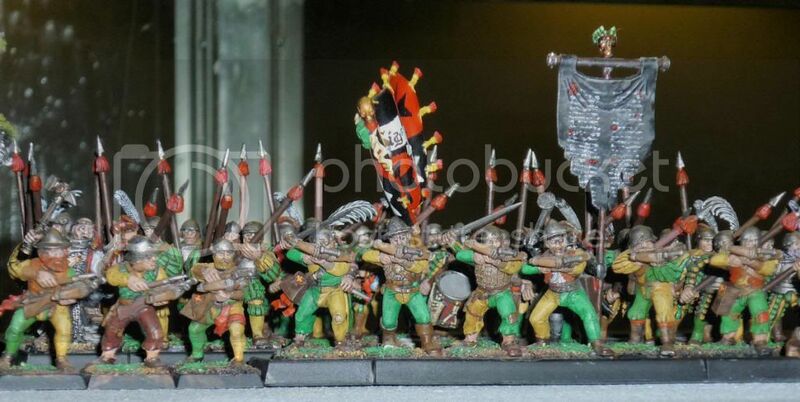 10 Crossbowmen, The anti-armour ranged unit, these guys can pick out the eye of a man in full plate from 30 paces. 6 Knights of the sacred scythe, permanent contingent at Roberto's request. 30 militia, recriuited from local populace to aid in the cause due to lack of alternatives. State Greatsword regiment. Armed from Roberto's personal treasury at great expense, these are the elite infantry, trained to fight well even in dense terrain. 5 Pistoliers, members of the sacred order of the scythe, training to be fully fledged knights. Hellblaster volley gun, Almarno's latest invention, a devastating piece of artillery. (may be missing units, can't check atm, I'm at work, will update at home if necessary). Greetings fellow Stirland Generals! I have recently stumbled upon this site while looking for Empire battle tactics and have enjoyed everything I've found here thus far ... this thread being my favorite lol! 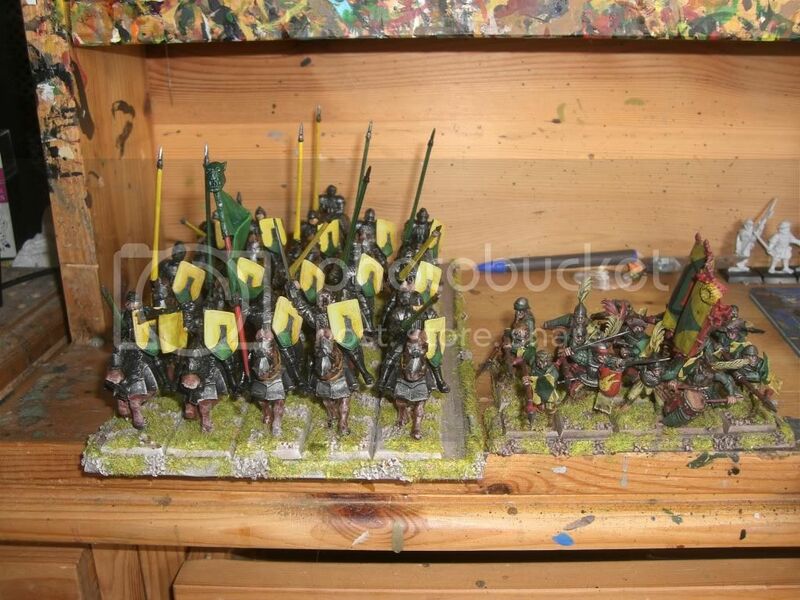 Anywho I figured I'd give my specs on my Stirland Army, along with a few pictures of what I have painted. Sorry that the pictures aren't the best, and I have more painted now, just no pictures of them, but I will try to post an updated shot. This is a 3,000 point army I currently play. I know Stirland is suppose to be poor, but I side with the group who says people believe that Stirland is poor because it is old-fashion, rustic, and holds to its traditions. Besides, this is suppose to be a grand warhost for all of Northern Stirland, so there has to be some artillery in there right? I have chosen to paint a Stirland Army. I have found the maps provided by this forum site very useful and have chosen to create the forces in and around Drebkau in the bit of Stirland next to the moot between the two Reaches. The Knights are the Knights of the World's Edge also known as the Brotherhood of the Black Tower. Add my name to the Stirland list. Username: Finngoalie - army name: The Stirland Tribunal - general: Arch Lector of Morr, Hans Von Knoblauch. Some might remember him from the Treachery and Greed campaign from this time last year....He slayed the undead Mordini in the end. I have a small allied contingent from Wissenland. The army's sole purpose is hunting undead and cleansing the Empire. Von Knoblauch has 2 knightly orders under his command, The Order of the Sacred Scythes and The Knights of Morr. The infantry are composed of The IX Legion Spearmen and the Scarlet Guards halberdiers. The Arch Lector has also been known to employ Spartans from Hellene in the Border Princes as mercenary allies. This originated in the Tribunal's hunt for the Strigoi vampire Gashnag in Tilea, where Gashnag had raided all the ancient graveyards from Remas to Pompeii and raised legions of skeleton gladiators. Von Knoblauch conducts his tribunal operations from Hornau in eastern Stirland, where several road intersections allow for rapid deployment in several directions. Not by coincidence, Hornau is also the Chapter House home of The Order of the Sacred Scythes. Von Knoblauch utilizes both Wurtbad Pistoliers and Wissenland Huntsmen for reconnaisance while 2 mortars generally compose the artillery train. All members of The Tribunal believe every Empire citizen has the right to eternal rest in death, no matter their social standing and hold all Gardens of Morr as sacred resting places. Despite the importance, or rather prestige, of the apiaries, much of Moritz county is still given to the growing of wheat, barley and corn and also the raising of cattle, sheep and pigs - the latter in particular. This region is known for its folk traditions of the "Moritz Dance" and the burning of the "Wicker Halfling", as well as the popularity of the Cult of Taal and Rhya - the latter does not lessen their dislike of Talabeclanders in any way. Second-in command and bearer of the battle standard. The main standard features a chariot-borne Freya. Sir Joachim Albrecht's Regiment of Crossbow - "The Yellowbellies"
Sir Heinrich Wissel's Regiment of Half-Pike - "The Longcoats"
Sir Johann Gessner's Regiment of Half-Pike - "The Shorthorns"
Sir Peter Leuchsner's Regiment of Half-Pike - "The Old Spots"
Sir Stefan Stahler's Regiment of Halberd - "The Barleycorns"
Sir Josef Weiss' Regiment of Halberd - "The Reapers"
Sir Martin Schwarz's Regiment of Sword - "The Saddlebacks"
The Moritz Company of Huntsman - "The Rohrwald Poachers"
The Stir River Patrol "Melk Division"
I guess our Warrior Queen of antiquety had quite a reputation. I will do a variant using the details from Sigmar's Heirs, and a third variant which shows regions/provinces - the names of these will be of my own devising as the author of Sigmar's Heirs doesn't seem to get the heirarchical divides of Counts, Barons and Baronets etc. New to the forums here, but after some very generous gifts from friends this year for the holidays, I'm going to be doing a heavily converted Stirland Army, with detachments largely coming from Sylvania. I plan on running two large units of State Troopers, 40 Swordsman, 40 Halberdiers, with a variety of other options. I play VC, and want there to be some elements of Sylvania incorporated, as Stirland is too poor to turn away the skilled Warriors of Sylvania. I'm even considering converting a Captain into a Vampire who see's serving the Empire in his short term interests. I join the ranks of the Stirland Generals! 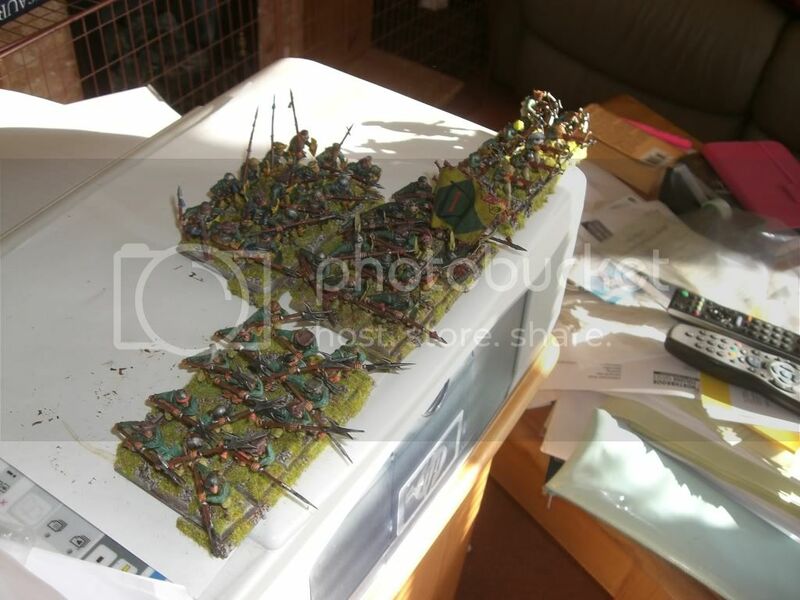 I have an old army from 5th edition a friend of mine left in my care years ago. He moved to New York and does not appear to be coming home anytime soon. At least that's what the wedding ring on his finger says. Anyway, since the army is in ramshackle and roughshod I've decided to put it right. What was painted is in the Stirland River Patrol colors and so that's the plan to continue on in. Everything listed below is the army contents in its entirety not a specific army list. For that obviously units would be chosen or forgotten per the game being played. If you question a few things (as I imagine you will) you'll have to keep in mind the models I'm using or going to be using. The Steam Tank is going to be represented by an Empire War Wagon, not a Steam Tank model and the Flagellants are going to be comprised of the models from the Sisters of Sigmar Mordheim range. Hopefully you all find this to be ample for the fluff of the army I'll be getting together. Estimated date to completion of project... Never... LOL! While it is unusual for the 3rd Company to fight battles far from their river it has been on occasion called for. Most often when the company is summoned by the Count to do battle elsewhere in his name. For this purpose they constructed a mobile fort of sorts from which they stage their attacks and use it as a mobile platform for some of their ships smaller guns and longer pikes. The 3rd Company is often accompanied and followed on the banks of the river by a regiment of Knights from the Order of The Raven whom hosts the Company in their home port of Siegfriedhof. Also the 3rd Company makes a monthly trek all the way up river to Waldenhof to ensure not only the safety of the river but to check the lands of Sylvania for the undead and scourge what could taint the waters of the Stir. At these times it is not unheard of for the Company to occasionally be Consigned a group of the Elector Count Alberich Haupt-Anderssen's personal Greatsword's all the way from Wurtbad. Not to mention that it usually garners some support from the Cult of Sigmar in the shape of a few witch hunters or Warrior Priests and The Order of the Merciful Sisters who still reside on Sigmar's Rock just outside of what was once Mordheim between Siegfriedhof and Waldenhof. I've just started painting my Empire up lately and at first I was going to go Nordland, went as far as to paint some, but I've had a change of my mind and went for Stirland, because I like their lore and the fact they are considered to be the least progressive of the provinces except there's more to them. I also want to include some Halflings and ogres in my army and I think Stirland is definitely one of the most suitable for this. So below is my army's name and leader. Froppenbach is the name of my town/city and my army is it's standing force. Time to bump up Stirland. I've been collecting and painting a Stirland troop for four years now, with modest progress. The army originated as a Free Company/Militia troop that has been enlisted into regular service and collected men and equipment here and there, mostly in "eastern Stirland", i.e. Sylvania. Rumours tell that the arcanists attached to the army are too deeply and personally involved in Death magics, but no sanctioned priests or witchhunters have condemned a member of the troop thus far. They kill the enemies of the Empire, and that's enough, it seems. The army is led by Zygmund, and is simply known as his troop of thugs. As of now, the troop headquarters are in Hundham ("Dog Home", or perhaps "Dogville"), near Waldenhof, where their main job is to patrol the road leading to Zhufbar and collect the Count's toll at the ford of Hundham (they get to use the toll for their upkeep, so they are very efficient). I've yet to take decent photos, but here are a couple. I'll probably start a plog if and when I might bother taking more pictures and showing off my gaming corner. Gendarmes, i.e. 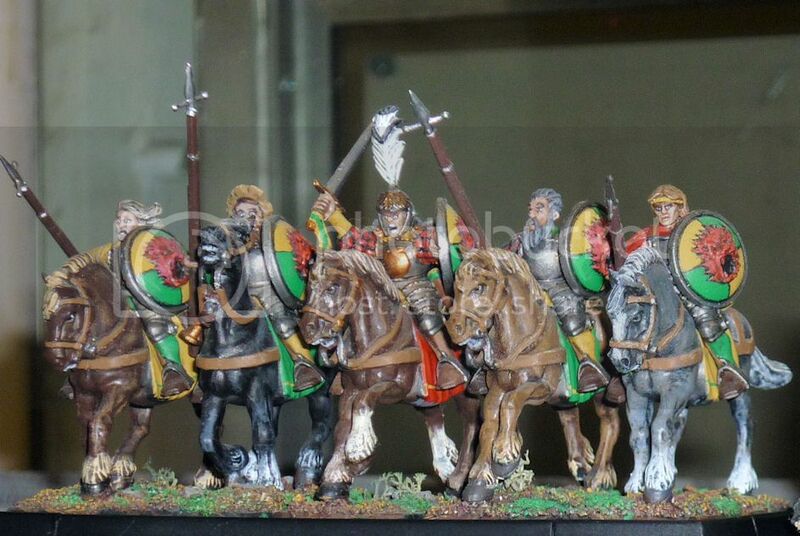 knights with lighter armour and no barding for the horses. This is poor Stirland, you know. Footfolk, with the Black Banner often carried as the battle standard when only part of the army is taking the field. This is the "behaved" regiment, with proper liveries and flags. There's another ragtag regiment with original thugs and drunkards from where Zygmund himself comes from. Black powder is still considered advanced among the men in this troop. Thus crossbows and bows make up the infantry ranged weapons. 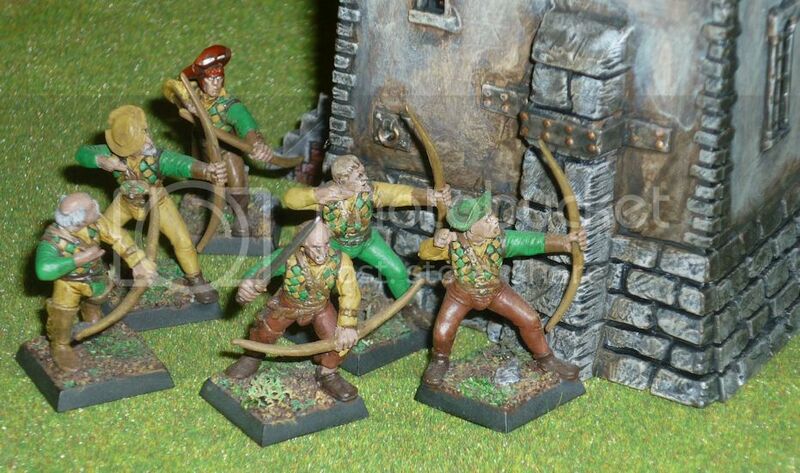 Here, a small band of semi-famous Stirland archers employed in the troop. Zygmund's Guard tries to imitate the Counts' Greatswords, but is notoriously small because the lack of full plate and skilled men. Here their thin lines are led by a Sigmarite priest and the youngish and eager witch hunter Heinz. Groups of militiamen like to offend the enemy from the protection of the Guard. The army also includes a couple of cannons, a mortar and a fighteningly advanced Helblaster operated by Nulnese hirelings under an Engineer. A small number of noble sons have bought pistols and ride about showing off. The mage Wolfgang, "Zygmund's Shadow", is accompanied by a very disciplined and quiet unit of hammer-wielding psychopats in black. In dire times, a detachment of the Kinghts of Morr or some random groups of southern mercenary knights have accompanied the troop, but they always return home swiftly after the battles. Zygmund has taken the field along with some Dwarfs many a time, and has made a name among the bearde folk as a stubborn drunkard - i.e. as a reliable fellow. going to figure out how to add in the Griffon legion. Lovely to see your Sylvania army, yet this thread is for Stirland. Remind me GP - which province is Sylvania in …………………. It's not part of Romania? Well there is a range of mountains in California and Nevada, does that count? Wait, that's it! The home of Vampire Counts! I love seeing Sylvanians, we need more armies from defunct provinces.